In the renovation of a 1950s building in Royan, France, interior designer Florence Deau selected a fleet of vintage and new furnishings. The dining table is from French retailer AM.PM., the pendants are by Him + Her, and the shelves are by Tomado Holland. An Ikea rug echoes the geometric motif found throughout the apartment. 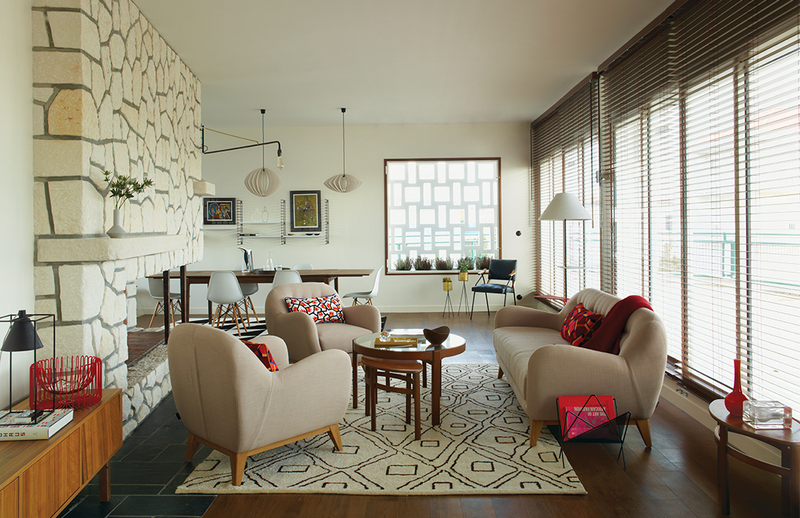 Deau retained original details, like the stone fireplace in the living area and the Jean Prouvé lamp mounted onto it. Vibrant throw pillows by Nathalie Du Pasquier for Hay offset the neutral sofa and armchairs from Habitat and the Moroccan rug. Vintage English occasional and coffee tables stand at the room’s center. Ceramics and objects from Guillaume Bardet, Jonathan Adler, and Ferm Living accent the space. The Basics series radiator by Italian manufacturer Tubes doubles as a towel rack in the bathroom. Deau purchased the cabinet and mirror from Ikea and she found the stool at a flea market. Farrow & Ball’s Babouche yellow enlivens one of the bedrooms. Farrow & Ball’s Hague Blue covers a wall in another bedroom. The light switches here, and throughout the apartment, are Hager’s 1930 series. Deau stationed a 1970s-era sconce next to the bed. The desk and cabinets in one bedroom are custom, and the chair is Patrick Norguet for Tolix. 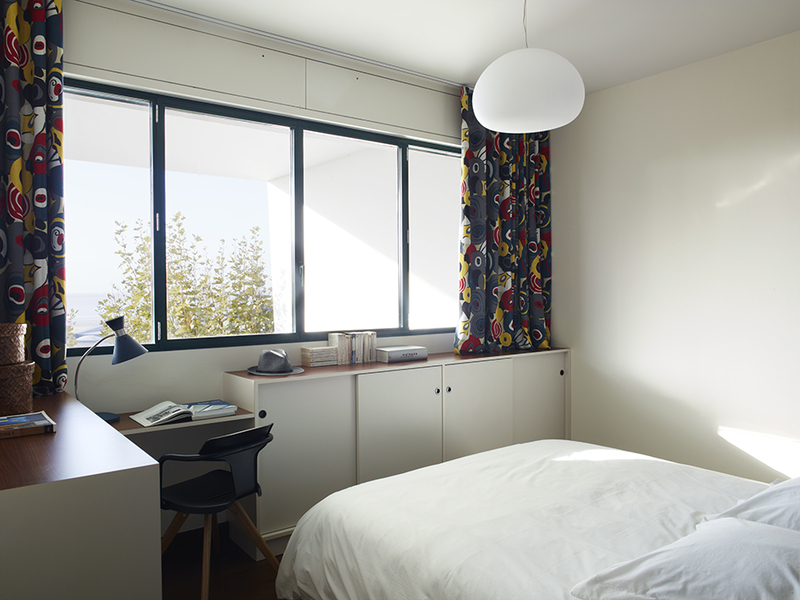 The curtains are made from graphic Gastón y Daniela fabrics. The apartment is located on the third floor of an Yves Salier–designed building. The structure is characteristic of the town's architecture. The city was rebuilt by modernist architects from the nearby Bordeaux school after it was destroyed during World War II. The apartment can be reached by a winding staircase. A Noé Duchaufour-Lawrance chair, Charlotte Perriand wall sconce, and Greta Grossman Grasshopper floor lamp round out a corner in the living room. Deau made the side table herself. Shelves from Danish company We Do Wood, pendants by Uno & Osten Kristensson, a rug by Pappelina, and a vintage chair adorn the entry hallway. The wood doors and frames are original. “It had to be inspired by the 1950s, it had to be fun—not too crazy—and it had to have a soul,” Deau says of the space. The space was uninhabited for 20 years before Deau discovered it. Deau sourced the apartment's high-low mix of furnishings from flea markets, local antiquarians, international design fairs, and boutique shops online. During the Belle Époque, the resort city of Royan, in southwest France, was a magnet for the high-society set. Blown to smithereens during World War II, the town was rebuilt in the 1950s by a clutch of high-minded architects from the nearby Bordeaux architecture school who were under the spell of Brazilian modernists like Oscar Niemeyer. They brought to the buildings curves, abstract forms, and reinforced concrete, scandalizing the conservative Royannais and alienating longtime visitors. The retooled town quickly sunk into a scruffy postwar obscurity and has only recently reemerged as a modishly offbeat spot to own a beach house. That’s where Florence Deau comes in. She has channeled Royan’s midcentury heritage and her own sharp eye for contemporary design into an influential blog, Flodeau, and an in-demand interior design practice. 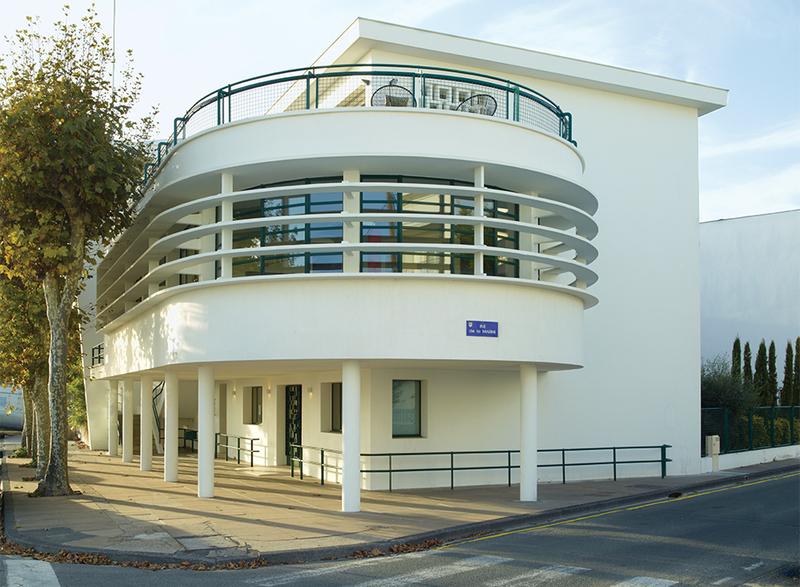 She is now at work transforming one of Royan’s emblematic modernist buildings, the former city planning office, built by the architect Yves Salier in 1952. It is an impressive showcase for any designer: sleek, white, concrete, with a glass curtain facade that curves along with the shape of the street and a vast balcony to take in the seascape. Deau has created a swank little wine bar on the ground floor and, on the top floor, a three-bedroom vacation apartment for a local wine merchant that’s a tribute to the ambience and history of Royan itself. In the bathrooms, Deau has paired faucets by the German manufacturer Hansgrohe with simple Ikea ceramic sinks. In the living room, Habitat’s budget-minded Balthasar sofa is grouped with a vintage English coffee table, a Lalique crystal ashtray, and an original Jean Prouvé brass light fixture that Deau discovered in the apartment and meticulously restored. To pull off this high-low two-step, Deau sources from far and wide: flea markets, local antiquarians, international design fairs, and boutique shops online— like Baan, for Thai handicrafts, and Galerie Møbler, for vintage Nordic furniture and accessories. She also conducts meticulous research. The only paintings in the apartment are by the Argentina-born French artist Nina Negri, a somewhat underappreciated Surrealist whose work, as Deau discovered, sells at a bargain compared to her male counterparts.